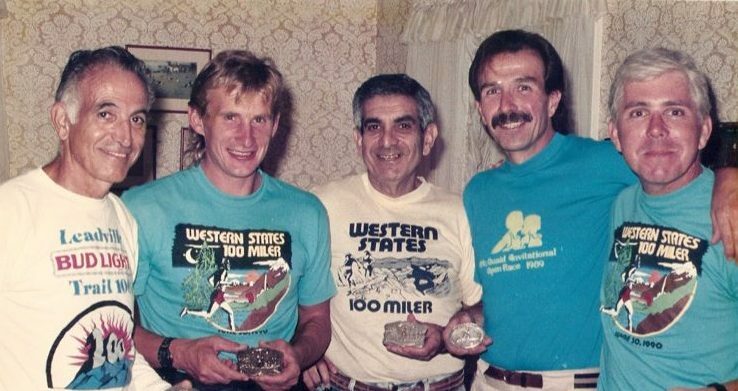 Charlie Sabatini and the Rochester, NY gang showing off their Western States bling. Charlie Sabatini ran his first 100 miler at Leadville. The year before while on vacation he saw a runner coming down from Hope Pass and thought “That looks fun.” The following year he went out to Colorado with a few friends, trained for five weeks and finished the Leadville 100. Almost 40 years later, as he accepted his award for yet another age group win during the Cardiac Hill Trail Run, 83-year-old Charlie raised his hand, waved and smiled. Then he shuffled back to his cozy spot in the lodge near the fire to applaud other runners for their accomplishments. Charlie has been running the roads and trails in Rochester, New York where he has lived and worked for over 63 years. He is so in tune with what has gone on around him that he remembers when some of the trees in these woods were just saplings. One of the pioneers of the local ultra scene, Charlie was part of a group of Rochester runners that ran ultras before most people knew what ultras were. Along with Dave Sek and John Prohira, they spin a story that reminds us that the trails we run on were once lined with young trees, and much younger runners. I met Dave Sek while on a trail run in Mendon Ponds Park in Mendon, NY. He was with a group of younger runners. Before we started he said, “Don’t worry about me, i’ll just be back here enjoying the view.” We took off, and when we rounded a corner later in the run, there was Dave, smiling and heading off in the direction we were about to go. After years of running these parks, Dave knows them like the back of his hand. A short cut brought him back in contact with the group. Everyone smiled and said “Hi Dave” as they ran by. On a spring night at Medved Running and Walking Outfitters, an entire room sat, leaning forward, taking in every word as 62-year-old John Prohira told about running through the night on a high mountain pass in the midst of completing yet another 100 mile trail race. It has been years since Prohira raced an ultra, but his storytelling is sharp and the entire room was hanging on every word during the Medved Trail and Ultra Community Forum. Many people consider Dave, Charlie, and John the driving force behind the introduction of ultras and mountain/trail running to the people of Rochester, NY. Rochester did not always have a vibrant trail running scene. Before any local running stores were here, before free group trail runs were offered by clubs, before anything was organized, runners would meet with a group called The Oven Door Runners. Always looking to push his limits, Prohira has competed in 89 ultras finishing 85 of them including twenty-nine 100 milers, including Western States, Hardrock, and Massanutten Mountain. Unlike the current local scene, which is offering ultra races almost every other weekend, the guys would have to travel to ultra events because there weren’t any local ones. Prohiras’ second ultra came one month after his first at the ‘Round Canandaigua Lake 40 Mile, directed by Charlie Sabatine. A constantly hilly route around a beautiful lake in Finger Lakes wine region of New York State, the race is now called Can Lakes 50 and has evolved along with the local running scene. Dave Sek at the Goose Adventure Racing Winter Fest 2015. Photo: Ron Heerkens, Jr.
Prohira hasn’t run a long race in some time – 2010 as he can best recall. He is, however, constantly reminded of the beauty of the sport because of the people. “There are people I know and have run long with who I might have seen but twice a year over a decade who I feel closer to than others I see daily. That shared experience, struggle and accomplishment binds.” To prove his point he he talks about a visit to Massanutten Mountain in May. Charlie still directs a few events with his wife Sara and they will soon have completed every section of the 950 mile long Finger Lakes Trail system. He wants people to have the same experiences and meet the same sort of people he has over the years. He has no plans on stopping, saying “Once you make this connection, it’s kind of like forever.” He points out people will say “Oh yeah, you are the runner.” No other activity has that. No one says “Oh yeah you are the card player, or you are the golfer”. That only seems to happen with us runners. Charlie Sabatini at the 2015 Johnny’s Running Of The Green. Photo: Ron Heerkens, Jr.
Eric Eagan is is an avid runner living in Rochester, NY. Eric tells his stories about the Western NY running scene in a unique way while sprinkling in his goals of motivating others to start running, keep running, and love running. When Eric is not running or writing about running, he is directing trail races, hiking the Adirondak Mountains, or snowshoeing and fat biking the trails and hills of Western NY. I still remember Joe Gilroy handing Bill Hearne his boots. One thing has never changed over the years–we still are always there to support each other, and we nearly always have a pretty good time doing it! The good old days of running–the characters that made running in your area special–the guys you would see day after day training at the same time and place–drinking beers after races—the clubs like Belle Watling of Buffalo with the older guys who had been around since before they had races on each day of each weekend—guys whose highlight of their season was dong Boston (that’s marathon folks)–back when Boston had tough qualifying times-and who can forget the young bucks like The Stotans—does this running scene exist anymore in the WNY area? Glad John Prohira knows about ARFTA. All of these guys belong there!